The Rhodesian Ridgeback's origins are from an African hunting dog which was used to track big game animals such as Lions and Cheetahs. From early in its origins the Ridgeback has been renowned for its loyalty, mild temperament, yet brave. The origins of the foundation dogs is believed to trace back to Ethiopia or the Southern Sedan. There is a drawing in an Egyptian tomb (4,000BC) that shows a Hound with drooped ears and what appears to be a ridge on its back. It seems that this was most likely the ancestor of the dog that was domesticated by the Hottentot tribe of Africa. The first known evidence of the Hottentot hunting dogs is a rock painting near Rasape in Zimbabwe. The painting is of the preparations for the burial of a chief. 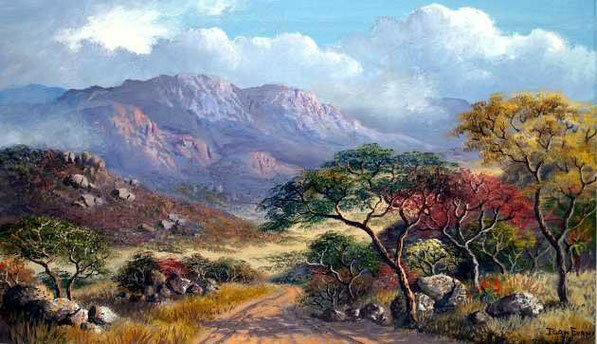 The Hottentots most prized possessions, cattle, sheep, and hunting dogs are shown. There are ridged dog breeds in Thailand, Cambodia and other asian areas. It is impossible to tell if the ridged breeds moved from the East to Africa or the other way around. Perhaps they developed totally independently. Khoikhoi dog. Ancestors of ridgebacks were owned almost certainly by the Hottentots - or Khoikhoi, as they called themselves. 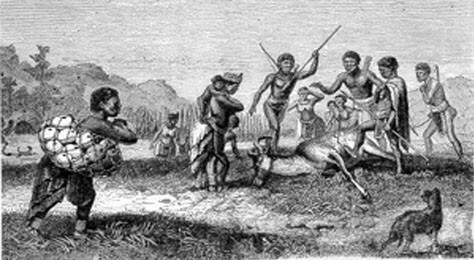 The Khoikhoi was the population the first Europeans found when they landed in Good Hope Cape region. The Khoikhoi had come from the Great Lakes Region some centuries before and, along with the big horned oxes and fat tailed sheep, they took with them in their migration a small-medium sized dog, 45 cm., pricked ears, a ridge on the back and a terrible temperament. Guardian and hunter. When European Boer settlers arrived in South Africa in the sixteenth and seventeenth centuries, they brought with them such breeds as the Mastiff, Great Dane, Bloodhound, Pointer, Staghound, and Greyhound, among others. These settlers needed a dog that could withstand both hot and cold temperatures, limited water, and rough bush, while performing the duties of guard dog and hunting dog. By breeding their Eurpoean dogs with native Hottentot tribal hunting dogs (which were distinguished by a ridge of hair growing in the opposite direction along the top of their back) they produced just such a dog. These dogs hunted by both sight and scent and were devoted protectors of the entire family. For more than 100 years after 1707, European immigration was closed. Consequently, the importation of additional dogs of these or other breeds became hard to come by and their value was high. The settlers needed a dog that could flush a few partridge, pull down a wounded stag, or guard the farm from marauding animals and prowlers at night. They also needed a dog that could withstand the rigour of the African bush, hold up under drastic changes in temperature, from the heat of the day to nights below freezing. In the 1870s, several of these dogs were taken to Rhodesia to hunt lions, chasing and harassing the lion until the hunter could shoot it. The dogs were so successful that the "Lion Dogs" became popular, their distictive ridge becoming a trademark of quality. By the 1920s, so many different types of ridged Lion Dogs existed in Rhodesia that a meeting was held to eludicate the most desirable points of the breed, which became the basis for the current standard. 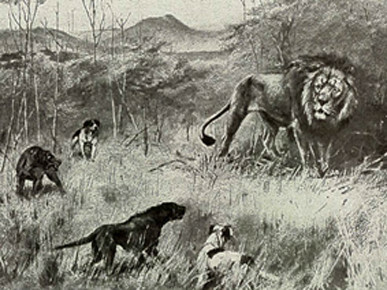 Dogs meeting the standard criteria were known as Rhodesian Ridgebacks (the dog's former designation as Lion Dogs was deemed to sound too savage). The results were brown dogs that were good companions, had the stamina necessary for the long hunt and could bring a lion to bay without getting killed. These hard working dogs were sometimes called "African Lion Hounds". 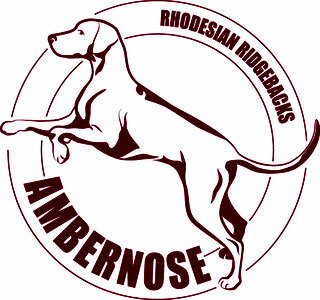 The breed today known as Rhodesian Ridgeback was established in 1922, thanks to the passion, constance and drive of Mr. Francis Richard Barnes.